Reserves Come Through Against Nationals ~ The Bucky Channel - The World of Sports from Wisconsin's Perspective. The last time Manny Parra took the mound, he ended up getting shoved by Prince Fielder in the dugout. 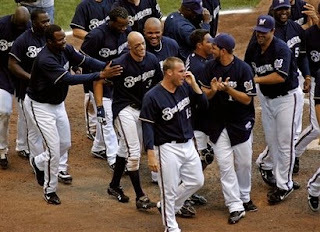 Since then, the Brewers have won five straight games including Sundays 5-4 victory over the Nationals in extra innings. I listening to Jim Powell on the radio the night after the Brewers had their dugout scuffle, and he tried to make his point very clear. Whether the Brewers go on a winning streak from here, or fall into a losing stretch, it won't be because of the fighting. Powell says things like that happen all the time, and have no affect on the outcomes of the games. I'm not so sure so, as this team has looked very focused, and very committed since that game. The game started as a pitching duel, with the National's John Lannan taking a no-hitter into the 6th inning. Manny Parra was dealing for the Brewers, too, giving up one run in seven innings of work. The teams were tied at one as they headed into the 8th inning, and Eric Gagne was on the hill. He was doing well until he ran out of stuff against Austin Kearns, and the Brewers were down 3-1. A Lastings Milledge home run made the game 4-1, and the Brewers had six outs to try for the comeback effort. Enter Mike Rivera. Playing in only his 16th game this season, the backup catcher went 2-for-3 and also drew 3 walks (the Brewers drew 13 walks as a team, and allowing just one). Rivera came to the plate with the bases loaded and delivered, with a 3-run RBI double to tie the game 4-4. Fans were then treated to extra baseball, as neither the Brewers nor the Nationals could muster any runs through the next few innings. Finally, in the 13th, Gabe Kapler came through. Getting the start in left for an injured Ryan Bruan, Kapler hit a shot off the left field foul pole, and the Brewers won in walk-off fashion 5-4. The Brewers will now try to ride that streak into Monday, as the two teams will take the field at 1:05pm. I'll be at the game, so they'll probably lose. Sorry in advance. TBC's Player of the Game: Love the walk-off, but this one goes to Mike Rivera. His first of the year! Instant Replay: Can't This Wait Until April? Let's Go For the Split! Packers Get Their "Must Win"
Boom Goes the Dynamite... UPDATE! Don't Take A Bite of that (Big) Apple, Brett! Mrs. Listach, We Found Your Son! We Have a Laynce Nix Sighting! Is That Madden? Can I Play?